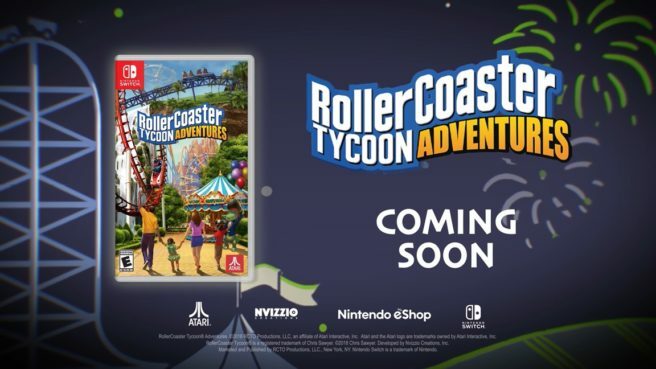 Atari has nailed down a final release date for its Switch game RollerCoaster Tycoon Adventures. Europe will have access first on November 29. The North American release will then take place on December 13. AtGames will be distributing RollerCoaster Tycoon Adventures stateside. Bigben is handling that responsibility in Europe. RollerCoaster Tycoon Adventures is the latest entry in one of the best-selling and most cherished franchises in PC gaming history. RollerCoaster Tycoon was created by legendary game developer Chris Sawyer and first released on Windows PC in 1999. The series quickly became a fan favorite for gamers. Nvizzio Creations, developer of the critically acclaimed mobile title RollerCoaster Tycoon Touch, returns as the developer of RollerCoaster Tycoon Adventures, bringing an exciting and accessible new twist to the world of RollerCoaster Tycoon. In RollerCoaster Tycoon Adventures, players have three distinct game modes to build their entertainment empire – Adventure Mode (a spin on the classic Campaign mode), tricky Scenarios and the open Sandbox. Over 120 wonderfully wacky rides, restaurants, and shops ensure parks burst with eye-catching action, and the intuitive coaster builder lets players create wild, death-defying coasters with ease. Four unique themed environments, along with water and terraforming options, ensure every park is distinct and exciting. A streamlined simulation and game economy allow players of all ages and skill levels to build the park of their dreams. Play it on your TV or on-the-go – becoming a RollerCoaster Tycoon has never been easier!